DON'T MAKE A MOVE WITHOUT enjoying this welcoming neighborhood with so many amenities. Stony Creek Ridge Subdivision offers a Pool, Clubhouse, Tennis Courts, commons areas, ponds, walking paths, trails, sidewalks, streetlights, and community events. A great place to live, work & learn, this home is in need of your personal touches. 4 bedrooms, great room, open kitchen with island, light maple LaFata quality cabinets, granite island, two pantries, nook with door wall to patio. Library/flex room, formal dining room. Open floor plan and staircase overlooking the 2story living rm and foyer. Master suite has a huge walk-in closet, all bedrooms are spacious and offer large closets. 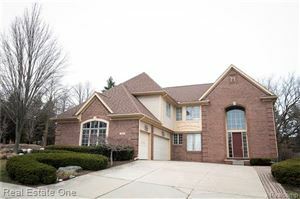 Three car side entrance garage, first-floor laundry, full finished basement with additional full bath. Make this home yours. So affordable and in an area you will love. North Hill/Hart/Stoney. Walk to downtown Rochester, Stoney Creek Park, Paint Creek/Macomb Orchard Trails, Onyx for ice skating/hockey. The data relating to real estate properties on this website was last updated as recently as 4/22/19 1:20 AM PDT.